Every episode you broadcast should have podcast show notes. The most basic include the name of the show, the episode title and the name if the guest if there is one, but most people do more than that. Below are some different ways you can put them together to support each episode. If you’re pushed for time, create a brief summary of around 100 words, and include a one-sentence bio of the guest and a line about two or three of the key topics discussed. You can add more to these if there’s no guest. Include links to the guest’s website and social media accounts, along with links to any resources mentioned. 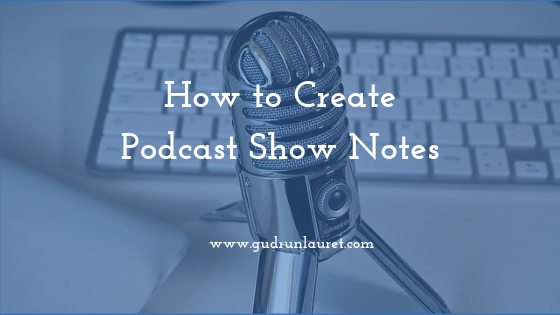 Show notes are a great way to entice people to listen to your podcast, and encourage them to listen to the end. Play the episode through (or refer to your transcript) and pick out 10 to 12 key points discussed, and create a bullet point list. The list will give the reader a flavour of what’s in the episode without giving too much away. The idea is that the site visitor will only get real value and learn something new by listening to the podcast. Phrase each bullet as a question where you can (why and how are easiest) so the reader knows that they’ll find the answers within the episode. You can also choose half a dozen key points and put these in a bulleted list at the top of your show notes, then write a paragraph or two (between 50 and 60 words) as a teaser – give a bit more information, but keep the best bits back. The paragraphs expand on the snippet in each bullet point, demonstrating how useful the podcast itself is. Creating these may take a bit of practice, so you may need to play the episode back a couple of times. If there are standard questions you always ask your guest, use these as a framework to build the podcast show notes around. 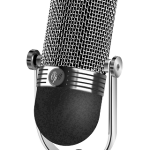 If you really think you’ll struggle, make notes during the recording of anything the guest says that catches your attention or you think will be particularly helpful to listeners. The process should be easier if you do a solo show, because you’ll spend time putting together a script or notes on key points to talk about. These will form the basis of your show notes afterwards. Don’t forget to include links to resources as well as other episodes where you discuss similar topics or go into more detail on one aspect. 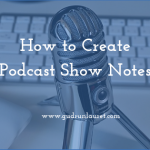 You can also create a longer guest bio or introduction for your podcast show notes, discuss a recommended tool or book, provide a top tip, give a link to the full transcript if you have one, or ask the guest to talk about something that’s relevant to the industry your show covers. If they’re offering a freebie, make sure it’s clear in the show notes how the listener can find this.